A village to the north with 1985 inhabitants in the year 1939, with its own catholic and evangelical parish. Zippnow also had a registration and district office, under the jurisdiction of Jastrow. There were 174 farms at this time. Location: On the Tempelburg - Jastrow railway at 125m to 140m above sea level in the north of the district. The village is the largest rural municipality in the district. The northern part of the village is crossed by the Plietnitz river. The larger southern part is built on two parallel roads, adjoined by short side roads. Between the two roads stand the two stately churches. The catholic church is surrounded by a wall and by large maple trees, whilst the evangelical church is set in beautiful gardens. The parts of the elongated village have various names. The Village: To the north of the Plietnitz is the Bußende (Repentance End), then there is the Mitte (Centre), the Mitteldorf (Central Village) and the Ort (Village). There are also Rederitz and Hasenfier Ends. Towards Feldmuehle is the kleines Ende (Small End). The parish is very large and borders the district of Neustettin to the north and east. There are no lakes in the parish, however there are many meadows and brooks. The ground consists of mergel and sandy soil. There are also crops cultivated. History: Economically Zippnow was a poorly managed place, and yielded little in taxation. In 1570 the governor of Deutsch Krone instructed the mayor Horn of Krone to re-establish Zippnow and gave him the Schulzenhof as residence. 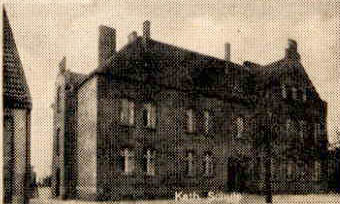 The Schulzenhof quickly changed hands and was divided. Best known amongst the sheriffs were Klappstein, Marczinski and Mlynkowski. During the 30 years war, Poland remained neutral. The Swedish aligned Pomeranian city of Neustettin was plundered by imperial soldiers. On the retreat, the imperial army passed through the Deutsch Krone area, and plundered there as well. Sheriff Mueller called on armed farmers to resist, but could not prevent the plundering of the village. 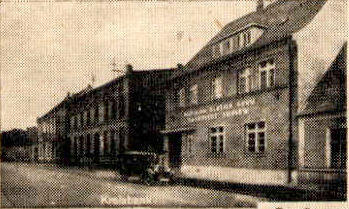 As a result of complaints made to the magistrate in Deutsch Krone, the village was compensated and granted the right to charge a toll on the Prinzenstraße (Princes Street) where it crossed the Plietnitz river. This toll remained until 1863. The large state owned forest was administered by a head forester based in Zippnow. In 1792, this head forester was called Kienast. 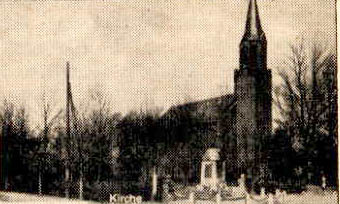 In 1789, Zippnow was a royal village, with two watermills and a catholic church. At this time, there were 113 families in the village. The Churches: The catholic church was probably ruined in the 30 years war. It was rebuilt in 1669, and belonged to the parish of Rederitz. It was raised to parochial church in 1690. Until 1780, the Protestant community had to pay tax to the catholic church. An independent evangelical parish was then formed under the jurisdiction of Hasenfier, and a simple chapel was erected in 1814. 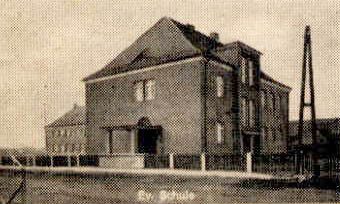 The large evangelical church was built in 1864. Photos: Originating from old newspaper cuttings, and supplied by Michael Nickless.